Polls have consistently shown higher levels of support among younger voters for legalizing marijuana, whether for medicinal or recreational use. The bigger question in Florida is whether a proposed constitutional amendment legalizing medicinal marijuana will actually raise young voter turnout to a presidential election year level. If so, it would buck normal mid-term election year patterns when young voter turnout usually plummets. There are plenty of reasons to believe that even a marijuana-related amendment may not be enough to spike college student turnout in November. A recent study by Harvard University’s Institute of Politics found that young adults are losing interest in voting, with just one-fourth saying they definitely will vote this fall. The Institute’s Director observed that “There’s an erosion of trust in the individuals and institutions that make government work—and now we see the lowest level of interest in any election we’ve measured since 2000.” An April Gallup survey also found that voter enthusiasm for participating in this year’s midterm election to be at its lowest level in at least 20 years. The vast majority (85%) predicts that the medicinal marijuana amendment will increase young voter turnout on college campuses this fall to presidential election year levels. A slightly higher percentage (88%) believes that a recreational use ballot initiative would have yielded a higher turnout. Some experts think that putting the medicinal marijuana amendment on the ballot in November will increase younger voter turnout to presidential election-year levels. Others say it will not draw as many younger voters. Which of these views do you believe? “I honestly think young voters will just come out to vote purely on the fact the amendment is about marijuana.” Female, 21. “Many of my colleagues that are not political science majors are aware and even follow news coverage concerning medical marijuana.” Male, 20. “Many people, especially young adults, will act on an issue if it pertains to them and interests them. Sadly, politics and the economy alone do not interest many young adults but the push for legalizing or not legalizing does. Therefore, it will draw them to vote.” Female, 21. “From what I hear from other peers and students around campus, most of them are in favor of the use of marijuana, both medicinal and recreational, so regardless of what the purpose of the use is, the subject of “marijuana” is extremely popular among the young individuals so they will be more likely to vote and voice their views on the topic.” Female, 25. “A lot of them probably don’t understand the amendment, but think it will legalize marijuana so they’ll come out anyway.” Female, 21. “I know many students who smoke illegally now and do not vote. If this were to be on the ballot, you would find them at the polls on Election Day.” Male, 20. “Many believe it will be easier and ‘more legal’ for them to use the drug regardless of whether it is medical [or] recreational. This is an attractive outcome for them.” Female, 21. “I’ve already seen an increase in interest towards this 2014 election among younger voters. 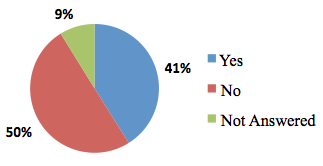 College students want marijuana to be legal. Most do it already. If medical marijuana was legalized, that would be one step closer to it fully being legalized.” Male, 20. 4. It’s Legal in Other States, so Why Not Florida? “The support of marijuana for medicinal and recreational use is a very liberal concept. Young people have long been known to support new and controversial things, so this issue has great potential to increase voter turnout for young adults. People look to the other states that have voted on the issue and wonder when they’ll be given the opportunity to address it locally.” Male, 24. 5. Alcohol is Legal, So Why Not Marijuana? ”I believe the number of younger voters will increase because a lot of students identify with the issue. We are a generation that does not like to be controlled by the law or government. Therefore, many students believe that just like we are permitted to drink alcohol, marijuana should be legalized as well. This issue has been in the media for quite some time and young voters will come out to show that they will not be ignored.” Female, 20. “The truth is most students are either already using or have experience with marijuana. They know the effects first- hand and they see it no different [than] alcohol.” Female, 21. 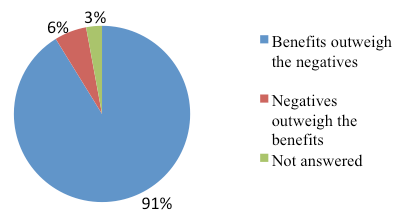 Some people think that overall the health benefits of medicinal marijuana will outweigh any negatives (potential bad side effects such as addiction). Others think the amendment’s negatives will outweigh its positives because of unethical “doctors” prescribing pot to make money for themselves thereby creating a problem similar to the illegal prescription pill mills that the state is trying to get rid of. Which of these views do you think is most common among Florida college students who will vote? “In my opinion, any drug can be abused and any doctor can also abuse the system. This occurs with pharmaceutical drugs right now, plus they are loaded with chemicals. Legalizing it can create misuse, but the people who deserve to have it will outweigh them. Banning people does not stop them from using it improperly; laws need to be created so violators can be punished accordingly. Cancer patients and others who need medicinal marijuana will surely benefit from this change.” Female, 20. “I think there are a lot of people that need an effective treatment for their medical problems; they did not choose to be sick. On the contrary, if individuals purchase the psychoactive drug illegally, that is their responsibility. Diseased people shouldn’t be punished for irresponsible people. I think that if medical marijuana is controlled properly, the benefits of legalizing it would outweigh the negatives.” Female, 21. “I did a news package on drug use on campus and what I found out is that students use it more recreationally as a social thing or stress reliever but when you ask them their opinions on it they all say it’s healthier than all the other stuff out there that is chemically- produced. Since it is grown from the ground, it is considered healthy. Also, the positive information that studies mainly reveal justifies these students’ opinions even more on why it’s not that bad.” Female, 22. “I don’t think many of them [fellow students] see it becoming an epidemic like the pain-killer issue because recreational use is legal in other areas of our country.” Female, 24. “Pain and suffering is something no one should deal with. Yes, fake doctors will arise, but people who would use them already use the drug. It wouldn’t cause a bigger issue than is there already.” Female, 20. “I have noticed that many young people, whether they are in college or not, have been very open to educating themselves on the benefits of marijuana.” Female, 23. I’ve watched documentaries on this topic. I have also read extensively about this topic. I do believe that the medicinal purpose of the drug does outweigh the “bad” that it does. Male, 21. “Marijuana has been proven to provide relief to pain and nausea, but has never been proven to have a long term negative effect on people. Most prescription drugs, alcohol, and tobacco are more dangerous than marijuana.” Male, 19. “It is a subject that hits close to home with me because I have a 20-year-old autistic sister who suffers from seizures. I have done a lot of research with my family and we hope it gets legalized so that we can see if it helps her. I think the benefits well outweigh the negatives because there are many forms of administering medical marijuana without THC.” Female, 23. Just a handful of students believe college students see the legalization of medicinal marijuana as yielding more negative than positive benefits. “The negatives of this bill outweigh the positives. The bill does not specify the particulars of when medicinal marijuana can be prescribed. Therefore, anyone “in pain” can request the drug. This undermines doctors who truly care about medicine and the well-being of their patients. Instead, this allows “doctors” who are only self-interested to make money regardless of the lack of benefits the prescription has.” Female, 20. 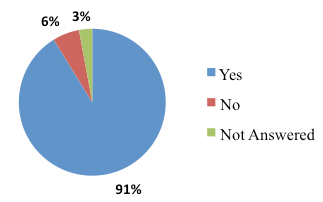 Being the controversial issue that it is, students anticipate a lot of activism regarding the amendment on campus this fall—but more from proponents (91%) than opponents (41%). Many base their predictions on having interacted with supporters seeking signatures on a petition to get the issue on the ballot. Others say the high profile nature of the issue makes it ready-made for intense campus debates. Do you expect there to be a lot of activities on campus in the Fall encouraging students to vote for the medicial marijuana issue? Do you expect there to be a lot of activities on campus in the Fall encouraging students to vote against the medicial marijuana issue? “A few months ago you could not go from one class to the other while on campus without being asked to sign a petition about medical marijuana.” Male, 20. “Several times on campus there were people with petitions to put medical marijuana on the bill.” Female, 21. “I don’t believe many will come to rally support against the issue because this is a topic that sits well with youth, who in general terms are more liberal than older generations.” Female, 23. “I believe that the Democratic Party of Florida and all the medical marijuana advocates are going to work together to get high voter turnout, especially with young people.” Male, 21. “Here at USF protesting is prevalent when it is pro/con a topic. I am certain there will be passionate students on this subject matter that will want to voice their opinions.” Female, 21. “I expect a lot of activity in favor and against legalizing marijuana because there are several organizations on campus that will get involved in the matter.” Female, 21. “I feel that many outside organizations will come and either persuade students to vote for it or [against it]. Needless to say, there will be campaigns for both sides of the debate.” Male, 21. Although it was “only” a special congressional election to fill the vacant seat of Congressman Bill Young, the really low young voter turnout rate for the March 11 contest paints a far less optimistic picture. 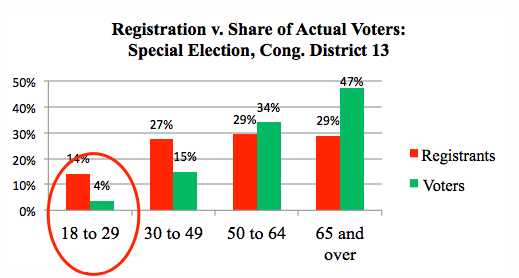 In the high profile CD 13 race garnering national attention and featuring record spending on Get-Out-The-Vote efforts, 18-29 year-olds made up 14% of the registrants but just 4% of those who actually voted. 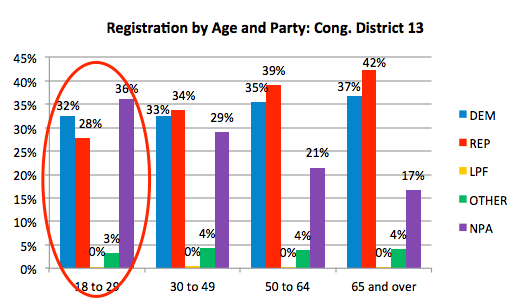 Turnout among 18-29 year-old Democrats (15%) was lower than among young Republicans (18%) in spite of the fact a higher percentage are registered Democrats (32%) than Republicans (28%). Among registered independents (No Party Affiliation), who tend to be younger and vote more Democratic, turnout was even lower (6%). Special election, Congressional District 13, March 11, 2014. Generated from data provided by the Pinellas County Supervisor of Elections. Florida has a long history of both parties using constitutional amendments as turnout mechanisms. Some efforts have been more successful than others. This year, Florida Democrats stand to benefit more than Florida Republicans from a presidential election-year turnout rate from younger voters. 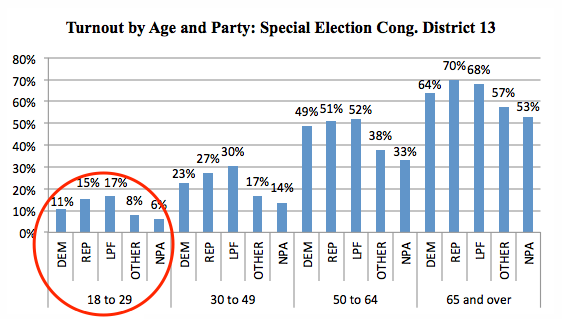 It was younger voters in Florida who put President Obama over the top in 2012 in the closest vote of any state in the nation as they were the most solidly Democratic-voting age cohort. They disproved a multitude of pundits who had predicted young voter turnout would go down in 2012; it actually went up in Florida. PS Ironically, younger voter turnout is likely to make more of a difference in the outcome of the highly competitive gubernatorial and congressional races than on the amendment itself.